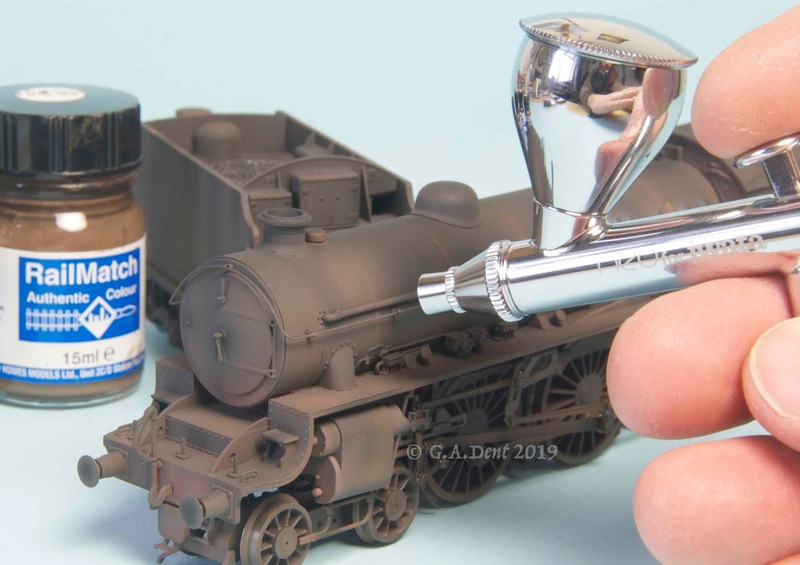 With the first instalment of Model Rail’s Skills Station appearing in the latest issue (MR258), the basics of how airbrushes work is explained in detail. To coincide, I thought I’d offer readers a list of the best airbrushes that I’ve come across over the past few decades. These are the tools that have consistently produced the best results, as well as being the most reliable and easy to use. The old adage of ‘you get what you pay for’ certainly rings true in the realms of airbrushing. However, a number of excellent entry-level tools have appeared in the past 10 years, boasting impressive specifications. Much depends on what type of work an airbrush is intended for, along with how often it’s likely to be used. For example, if you’re only likely to paint one or two models per year, in a fairly generic fashion, then there’s little point in breaking the bank. In contrast, those aiming to apply livery coats and delicate weathering effects to a wide range of models will benefit from an investment in a tool that can cope with those demands. Here, then, are my personal - and totally independent - recommendations, including a number of budget-priced options. All are suitable for use with enamel and acrylic paints and their related solvents. There are a lot of cheap airbrushes on the market, but so few of them are actually any good. Their limitations are soon discovered during use and, especially, when it comes to cleaning and maintenance. Indeed, they’re most likely to be the primary cause of frustration and disillusionment for beginners. It’s no coincidence that all of my preferred mid- to pro-level price range tools are from the Japanese Iwata range as, having tried so many other brands/models (some of which have been more expensive), none have come close to the performance and reliability of the Iwata airbrushes. The Neo brand is a budget range commissioned by the renowned Japanese airbrush maker Iwata, offering high quality entry-level tools at affordable prices. The CN is an internal mix, dual action airbrush which is versatile and easy to use. The small nozzle size (0.35mm) makes it great for livery painting in ‘OO’ and smaller scales, as well as all types of weathering work. A similar airbrush, the BCN, features a 0.5mm nozzle and syphon-fed paint cup for larger tasks. Optimised for use at low pressures, it’s well suited to smaller compressors and a 5-year warranty is provided, so there’s no need to worry about build quality and longevity. 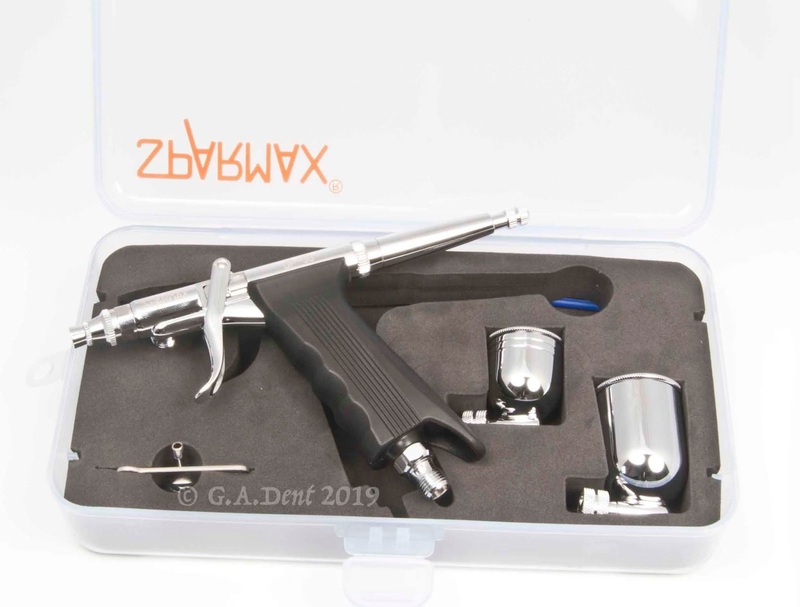 This is one of the best budget airbrushes with which to learn and it’s also reliable enough to be used by the more experienced and demanding hobbyist. Current UK price is around £70.00 inc. VAT. Similar in terms of specifications and performance to the Neo CN, the TRN1's pistol-type grip is more comfortable, especially when working for longer periods. The extra bulk can make it feel a bit unwieldy, particularly if working in close-proximity to small, delicate models, but the addition of a pre-set handle is a boon for detail work. Large and small interchangeable paint cups are provided and a side-feed version with a larger nozzle is also available (TRN2). At around £160, they’re at the higher end of the budget range and, unless you definitely prefer the idea of a pistol-grip tool, I’d be tempted to look at a ‘real’ Iwata airbrush from the Revolution or Eclipse range (see below), which are similarly priced. 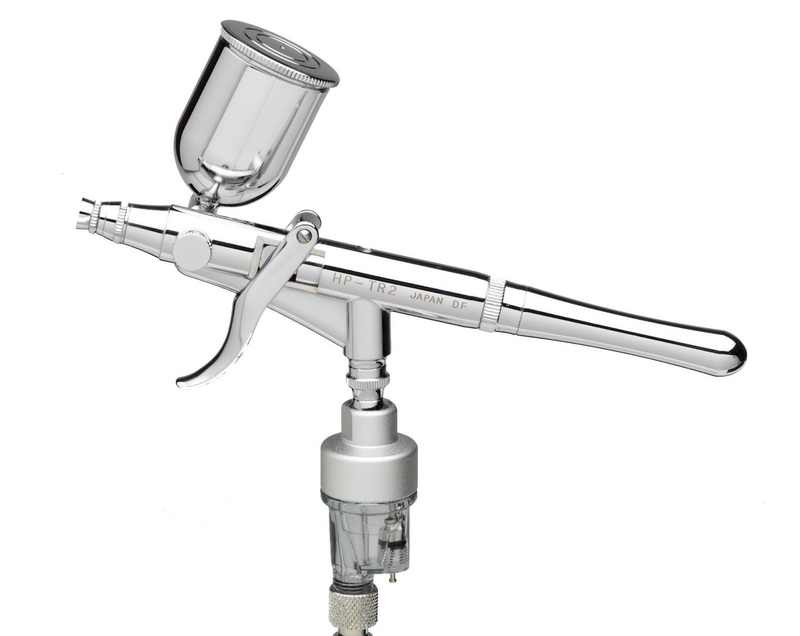 Sparmax have offered a wide range of budget airbrushes and equipment over the years. Some of it has been great, some of it hasn’t. Among their best airbrushes are the SP-20X and SP-35C. The SP-20X has a fine 0.2mm nozzle, suiting it especially to the most detailed of weathering tasks, or more general use on smaller models (such as ‘N’ gauge trains). This tiny nozzle aperture makes paint thinning important, with heavier paint formulas (such as Humbrol enamels and acrylics) often proving troublesome. Correctly thinned Phoenix or Railmatch enamels and Tamiya acrylics, however, work well. Two interchangeable paint cups (large and small) are provided and you can even get a decent amount of paint in the open aperture without a cup attached, thus reducing the weight of the tool and opening up the view to the tip for unrivalled accuracy. Just be sure to handle the fine needle with care, as the material isn’t as forgiving as those on more expensive airbrushes. 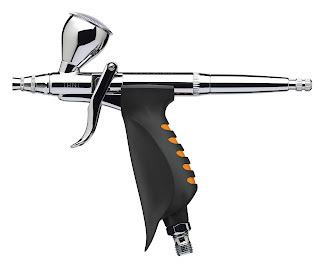 An alternative air valve is provided to convert the airbrush into a single action device, which may be useful for beginners struggling to master the dual action (where paint and air are controlled by the same trigger). The SP-35C is a new version of the discontinued Premi-Air GP35, one of the best budget airbrushes I’ve ever come across. This updated version, however, offers a pre-set handle (as does the SP-20X), which allows the user to limit the amount of paint that’s emitted – perfect for novices. The SP-35C has a larger nozzle – 0.35mm – making it more appealing to 4mm scale modellers for general painting tasks and fine weathering work. It’ll make hard work of painting ‘O’ gauge models but will prove useful for weathering in larger scales. Build quality of both is impressive for the price and both tools are easy to dismantle for cleaning and maintenance. The pre-set handle is a welcome bonus, suiting both tools particularly to precision work. Their specification and performance are hard to beat in this price range (£50-£60 each). These pistol-gripped airbrushes are incredibly comfortable to use, even for long periods. The 0.5mm nozzle and larger paint cups of the GP-50 lend it to overall livery applications and other similar tasks (it’s great for repetitive livery jobs). The screw-on paint cup offers greater security from spillage and can be fixed at varying angles – perfect when painting track or scenic items in situ. The GP-35 is virtually identical, save for a 0.35mm nozzle. Dismantling and cleaning is straightforward, although more time-consuming than the tradition top-button type of airbrush. Alas, there’s no provision for fitting the paint cups on the other side of the tool to suit left-handed users (see the Iwata Revolution TR2 below). That aside, they’re pretty reliable and effective general-purpose tools, currently priced around £90 each. This duo of Japanese-made tools has served me well for decades, without a hint of trouble. I may have other, fancier airbrushes for specialist applications, but these remain my first choice for the vast majority of my general modelling work. Extremely well designed and built, the quality of materials and machining is high, while the tools also boast long-life, solvent-proof seals within the needle packing and air control valve. The CR is an ideal workhorse, the 0.5mm nozzle being perfect for priming, liveries, clear coats, general weathering and scenic work. The BR, with a 0.3mm nozzle and smaller paint cup, is especially suited to weathering jobs, although the lack of a lid for the paint cup can lead to stained trouser legs! These are great value, easy to clean, comfortable and ultra-reliable, the ‘no frills’ spec keeps the cost down, without compromising performance. Moreover, for anyone starting out or looking to upgrade, the Revolution CR is probably my number one recommendation (or the BR for ‘N’ gauge modellers). Not much more expensive than many ‘budget’ tools (around £130 each), it’s a worthy investment that should last a lifetime. Indeed, when bought from an official dealer, a 10year warranty is provided with ALL Iwata airbrushes. Offering a slightly superior specification to the Revolution range, one of the main advantages of the Eclipse line is the ease with which they can be stripped for cleaning and maintenance. In terms of performance, there isn’t much in it, but the Eclipse just trumps the Revolution in terms of versatility; allowing the one tool to do a wider range of tasks, from ultra-fine work to broader coverage. The Eclipse CS (£185) sports a 0.35mm nozzle and the tool has been designed expressly to work with heavier hobby paints, such as enamels and acrylics. From the High Performance product line, this tool provides the perfect platform for achieving quality paint finishes and weathering effects. The adjustment valve below the nozzle allows instant fine-tuning of the air pressure while you work and a pre-set handle is provided. The 0.3mm nozzle size is ideal for delicate work, with an extremely fine spray pattern. It has also proved effective for painting livery coats on ‘OO’ and ‘N’ gauge models. Simple to clean and maintain, PTFE seals are incorporated for long life and resistance against solvents. One thing you’ll notice when you spend a little more on an airbrush, is the fact that the interior surfaces are mirror-smooth, thus vastly reducing the likelihood of paint becoming clogged within the tool - a common issue with budget airbrushes. At around £200, it may not be cheap but it will last you a lifetime. Aimed squarely at the professional end of the market, this specialist tool provides precise control and supreme performance. The hardened stainless steel needle is highly polished for smooth action and lower risk of paint retention and the integral micro valve permits fine-tuning of the air pressure for extra control. A 0.23mm nozzle is fitted to this model and an alloy tailpiece cuts down the weight of the tool, maintaining a pleasant balance overall. As you’d expect for the price (£460), build quality is second-to-none and the tool is fitted throughout with solvent-resistant seals for long life and reliable operation. Easy to clean and maintain, this has quickly proved to be a favourite tool for the more demanding weathering and painting tasks. It's not the most versatile, by any means, but in terms of performance and build quality, it's by far the best airbrush that I’ve come across. 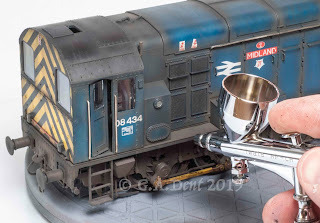 Next month's Model Rail will feature a detailed study of airbrush compressors and I'll be posting a similar 'GD's Favourites' list on this blog in due course. Hi George, being a painting master that you are. I came across a brand i've heard little about. Only available from one place not even on ebay. "Zero Paints"
Something you may wish to have a try with or even the Primers pre-thinned. Hi Jeremy, Thanks for the comment. I've seen the Zero Paints advertised in a couple of magazines but haven't tried them yet - will have to get hold of some.